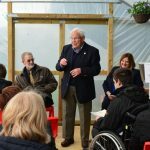 Home / Grow & Learn Project / Growing and learning together – Help Yourself Grow, Glasgow. Fair Deal, is a social care organisation that support people with learning disabilities in Glasgow and part of this service is offering young people the opportunity to participate in an innovative training programme called ‘Help Yourself Grow’. The programme focuses on delivering training in gardening and cookery. The Caley Grow & Learn Award is the preferred training programme that the gardening trainees work towards during the course of the year. Two recent trainees, Leanne and Scott are a gardening couple who decided to participant in Help Yourself Grow with Scott successfully completing his Caley Grow & Learn Award in 2017 and Leanne in 2018. 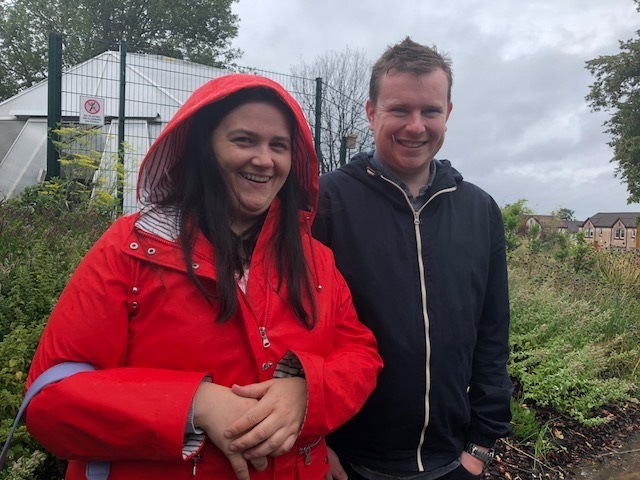 Both Scott and Leanne agreed that they really enjoyed learning more about gardening, in particular growing flowers and vegetables. 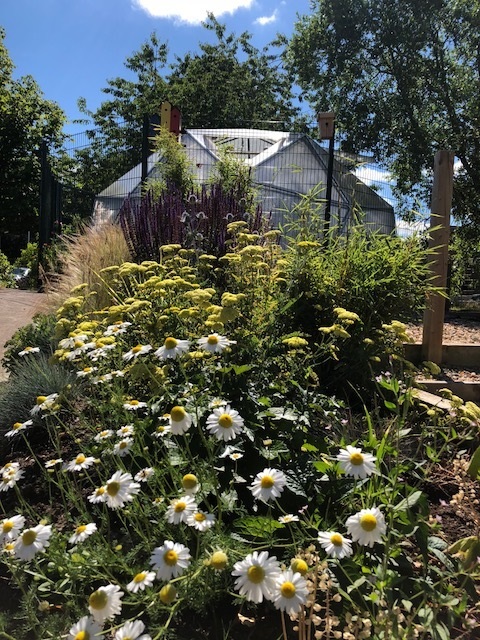 Leanne especially enjoyed working in the flowerbeds at the Jeely Piece Garden in Castlemilk, while Scott preferred potting on young plants grown from seed in the geodesic dome. The Jeely Piece Garden, Castlemilk. Scot also enjoyed the physical benefits of gardening, being outdoors, in particular digging and harvesting vegetables and fruit from the garden. Both Leanne and Scot also shared that this opportunity has helped them to meet new people and develop their confidence too. Although they are both heading off to college now, Leanne has decided to volunteer every week at the HYG Cookery training programme. Her love of food and cooking has developed over the years and learning all about growing herbs and making mint tea as part of her Grow & Learn award has helped sparked this interest. In the summer of 2018, Leanne and Scott supported our Caley Grow & Learn stand at Gardening Scotland. A group of trainees from HYG volunteered on the day and gave a fabulous workshop on how to make bug hotels. 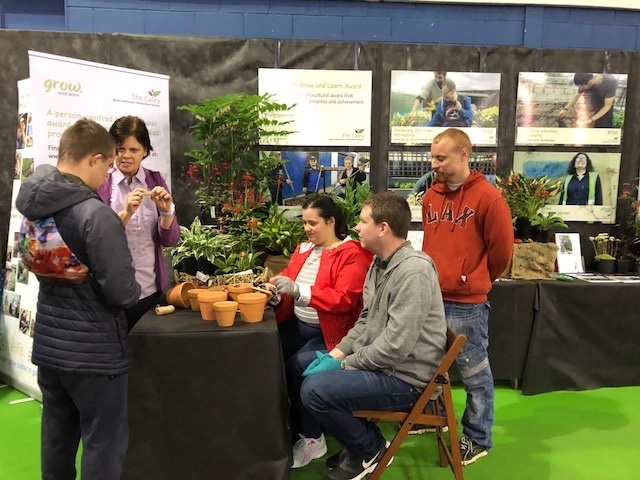 As well as highlighting the importance of giving nature a home, the demo attracted a crowd of visitors from the show, keen to find out more about Grow & Learn. Scott and Leanne have also been involved in helping to shape the future of Grow & Learn. They have made a valuable contribution by sharing their views and ideas about how best to develop our Award. It’s with thanks to people like Leanne and Scott that we can continue to develop Grow & Learn, ensuring that it continues to be a person-centred learning opportunity.